As you guys know, I love decorating for anything, and Christmas is my favorite....glittery things, sparkly things, and you all know how much I adore twinkly lights EVERYWHERE!!!! Cupcake Ornaments: they were gifts that I love!!! I also put up my white tree by my desk, and it looks pretty in the window at night too! 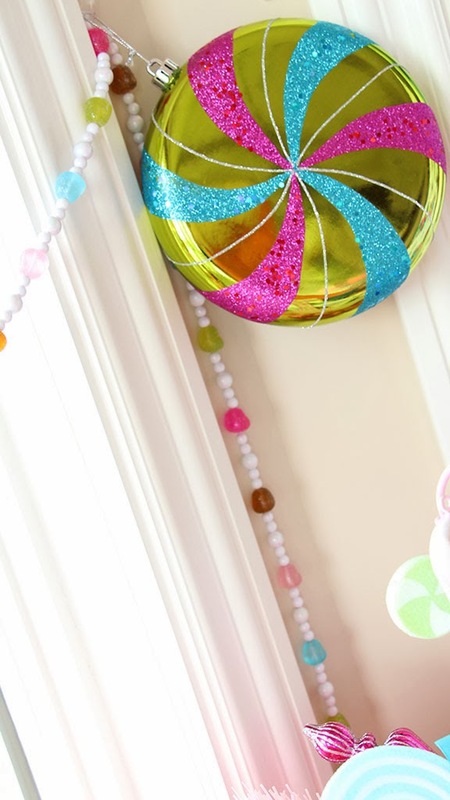 I got that the year before and the "ornament garlands" I got at Target a few years ago too! PS. I cleaned my desk off for you guys, it was covered with DIY goodies like hot glue guns, glue sticks, pipecleaners, make-up goodies...yes a DIY and fun videos are on the way! 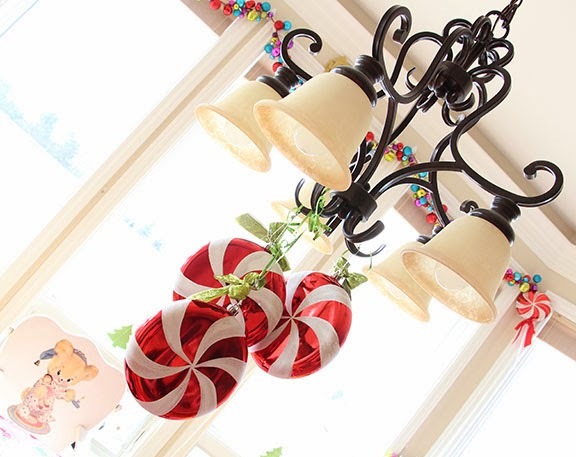 I always hang these giant peppermint candy ornaments from the light in the dining room! 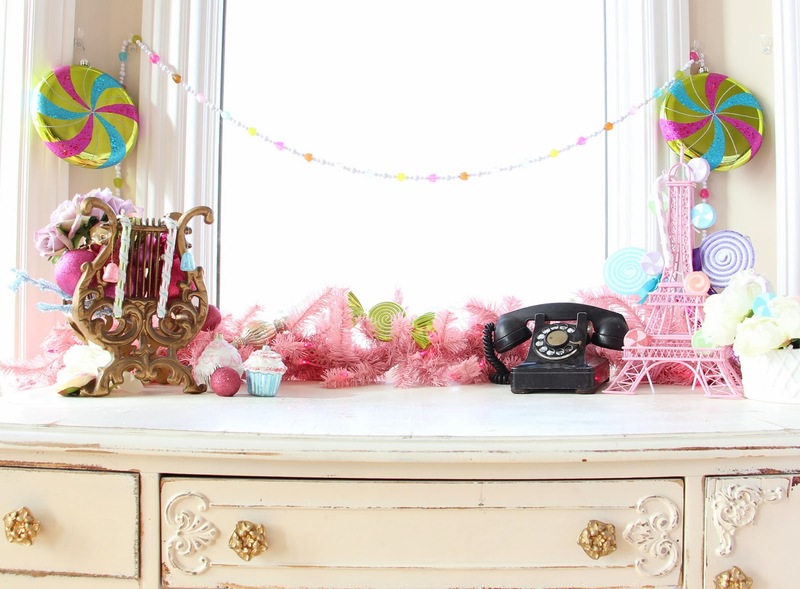 I want it to really feel like you are in a candyland, wonderland! That is Ellie's lil' "tall chair", it's an vintage wooden chair that has a tray to make it a high chair or you can flip it to the back and they just have a tall chair to sit at the table with, like a big girl! And last but not least, our lil reindeer. 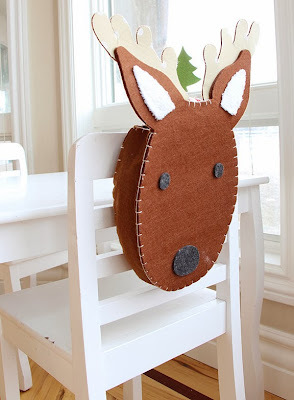 How cute are these little chair decorations? They just button onto lil chairs. I got him at Pottery Barn Kids last year, there was only one left, so I'm hoping they have his friends this year in stock too! And in the background I put little green foam-glittery trees in the middle of each window. And that is our Chrismas cheer in the dining room / my office, or not really an office, it's more like, I just have a desk there! Let me know if you guys want me to post a different room everyday and if you also want a video tour too! And I'm off to edit my "Holiday Gift Guide For The Girls" video...you get a sneek peek of my house decorations in different rooms in it too...It should be up later today on my YOUTUBE CHANNEL!